Wow â€“ Chuck Hayden just finished quite a Pure Michigan adventure! Check out his story about just one leg of his epic journey. Lake Superiorâ€™s chill waters were an ominous slate gray and the lake was steaming with fog banks 40-feet high as Carl Hammer slipped into his 17-foot wooden fishing skiff and started his outboard engine. It was 7 a.m., November 26, 1958 â€” the day before Thanksgiving. The 26-year-old North Shore fisherman figured heâ€™d get to his offshore fishing nets before a storm came up, pick his catch, and get back quickly â€” just as heâ€™d done hundreds of times before. Heâ€™d have to hurry. At a function attended by Prime Minister Helen Clark and Auckland Mayor John Banks, the New Zealand National Maritime Museum announced grants, scholarships and donations to the tune of nearly $9 million would be used for the building and exhibition project Blue Water Black Magic: A Tribute To Sir Peter Blake. Black Magic, or NZL32, led by Sir Peter defeated Stars and Stripes to win the America's Cup in San Diego in 1995. The boat will be suspended in the Hall of Yachting and the accompanying exhibition will surround the yacht on three levels, chairman of the Maritime Museum Alastair Aitken said. Condor Ferries Commodore Captain Ian Perry is preparing to take time off from the helm of his giant wave-piercing fast ferry catamaran to skipper a 100-year-old Cornish gaffer in a classic yacht festival in Brittany. But Ian, whose wooden gaffer Whim is moored at Pill Creek in Feock, has come up with a novel way of combining his job and his hobby. The captain has booked a space on the state-of-the-art Condor Express to transport himself and Whim across to France later this month. When Austin Sperry's future father-in-law started spinning tales of his past accomplishments as a sailor, he did what just about any smart young man in his position would do. He kept his opinions to himself. "He said, 'Hey, I won this and that,'" says Sperry of his initial sailing conversation with John Dane III. I'd sailed Hobie 16s as a teenager, and I'd longed for a Miracle 20 for what seemed like forever, when I finally found one I could afford in December 2005. For $600, I got a 1993 model with about 10 holes in each hullâ€”which were full of sandâ€”the transom ripped out, and no rudders. Needless to say, it was a fixer-upper. The most adventurous thing I ever did in my life didnâ€™t happen on the reefs of Indonesia or on the rivet-ruined roads of Baja or deep in the Fijian jungles hiking toward a rumored surfing Mecca. No, unfortunately for me, my most adventurous moment happened at Topanga Canyon State Beach in Malibu, California in 1992, during the summer between sixth and seventh grade with a guy named Peter Finn. If surfing has taught me anything, itâ€™s that you deal with what youâ€™ve got in front of you, but Iâ€™m still inclined to exercise creative license here in making up a better start to my surfing careerâ€”something a little bit more glamorous, perhaps. Not far from the Hackley and Hume historic sites and the Muskegon County Museum downtown are structures waiting to provide visitors a look at a different time in our history. Yet few people realize the existence of these structures, some more than 100 years old and hundreds of feet long, unseen by the naked eye. There's always a lesson in an overboard recovery. Cliff Shaw looks back at pulling two live bodies out of the water in the recent Doublehanded Farallones Race and says, "You see people in the water and you think, This is not a drill; I have to get this right." 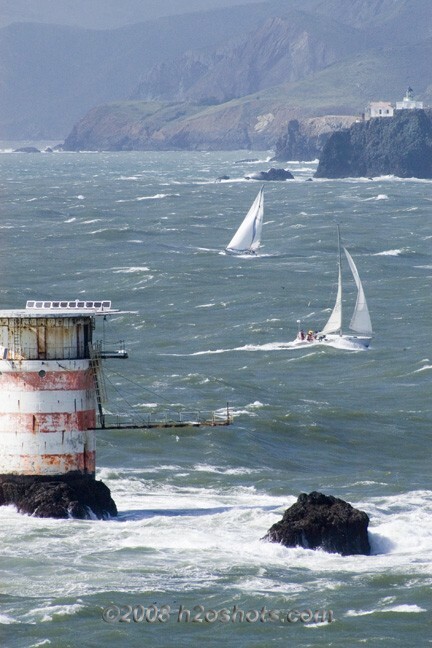 The breeze was 25, up to 30 at times on the Unpacific Ocean, outside the Golden Gate. Shaw figures the seas at, "Six to eight feet, with an occasional twelve. I did the wrong thing on my first approach. I tried to luff up to them and misjudged and fell short." A good product will sell itself. That's what has happened to the Little Current Cruisers Net based in Little Current, Ontario. (See "North Channel Retrospective," Cruising World, May 2006.) Serving Lake Huron's North Channel during July and August, this VHF-based cruisers net has experienced remarkable growth. Roy Eaton founded the LCCN in 2004 with the help of local restaurant owner Bruce O'Hare. The World Anti-Doping Agency (WADA) has reopened the case of New Zealand sailor Simon Daubney, cleared after testing positive for cocaine during the last America's Cup in Valencia. WADA's director general New Zealander David Howman last week lodged papers appealing Daubney's case with the Court of Arbitration for Sport in Switzerland. Andrea Gutsche doesn't have to rent a movie if she wants to get spooked about scary-looking monsters on the Great Lakes. The Toronto-based author regularly came across accounts of sea serpents when researching titles such as The North Channel and St. Mary's River: A Guide to the History and Superior: Under the Shadow of the Gods. "There's definitely sightings and mythology around this," she said in a telephone interview. "It's very intriguing, isn't it, when you get that many sightings? Who knows where the truth lies in it all? Something definitely has been seen." Q â€“ How did you get involved with Austin and John Dane? A â€“ I bought my first Star boat from Austin in San Francisco. It was his fatherâ€™s Star 7310. We had a lot of fun racing up and down the city front. At that time, Austin was working with Banc of America Securities. During this period, I had some good results in the Star with a 14th at the Bacardi Cup in 2002 sailing with Paul Erickson and Austin had heard about my coaching background. In 2007, I saw Austin down in Miami during the OCR while I was crewing for Colin Beashel. Austin mentioned coming into the program but definite plans were not made. Later in 2007, Austin contacted me about coming to Portugal with them for the ISAF worlds. After the worlds in Portugal, we made plans for the US trials, it was convenient for me because at that time I was living in Newport Beach only an hour South of Marina Del Rey. Our objective was to win the trials and then plan the following year. Diana was in great demand. The Lamotrek women decorated her with lava-lavas, floral wreaths, and turmeric rouge. I was disappointed but not surprised when she refused to adopt the authentic dress, or more accurately, lack thereof. I couldn't pronounce the names of the five boathouses, so from the island's northern tip down I dubbed them North Pole, Cancer, Equator, Capricorn, and Antarctica. With Francis as my host, I naturally fell in with his House Of Cancer. Fitting, because downing those copious cups of tuba began to feel like swallowing chemo cocktails.